The design of the KX-TDA100 and KX-TDA200 allows you to expand your system as your needs grow by simply plugging in additional cards and adding telephones. All of the expansion card slots are universal, so that any card can be plugged into any universal slot, allowing maximum use of what’s available within the cabinet. 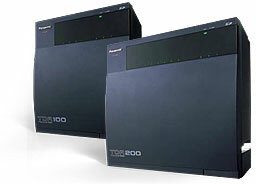 What’s even better is the TDA expansion cards operate on both the KX-TDA100 and KX-TDA200 systems. That means if you outgrow the KX-TDA100 system, you can unplug the expansion cards from that system and plug them directly into the KX-TDA200 without having to buy a whole new system. In terms of maximum system capacities the KX-TDA100 can offer up to 96 ports and the KX-TDA200 can offer up to 192 ports with 128 wireless telephones.